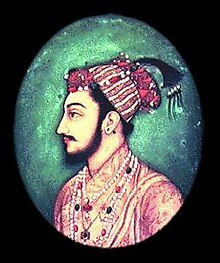 Dara Shukoh, also known as Dara Shikoh (Urdu: دارا شِکوہ ‎), (20 March 1615 – 30 August 1659) was the eldest son and heir-apparent of the Mughal emperor Shah Jahan. Dara was designated with the title Padshahzada-i-Buzurg Martaba ("Prince of High Rank") and was favoured as a successor by his father and his older sister, Princess Jahanara Begum. In the war of succession which ensued after Shah Jahan's illness in 1657, Dara was defeated by his younger brother Prince Muhiuddin (later, the Emperor Aurangzeb). He was executed in 1659 on Aurangzeb's orders in a bitter struggle for the imperial throne. Dara was a liberal-minded unorthodox Muslim as opposed to the orthodox Aurangzeb. A great patron of the arts, he was also more inclined towards philosophy and mysticism rather than military pursuits. The course of the history of the Indian subcontinent, had Dara Shukoh prevailed over Aurangzeb, has been a matter of some conjecture among historians. Muhammad Dara Shukoh was born on 11 March 1615 in Ajmer, Rajasthan. He was the first son and third child of Prince Shahab-ud-din Muhammad Khurram and his second wife, Mumtaz Mahal. The prince was named by his father. 'Dara' means owner of wealth or star in Persian while the second part of the prince's name is commonly spelled in two ways: Shikoh (terror) or Shukoh (majesty or grandeur). Thus, Dara's full name can be translated as "Of the Terror of Darius[disambiguation needed]" or "Of the Grandeur of Darius", respectively. Historian Ebba Koch favours 'Shukoh'. Dara Shukoh had thirteen siblings of whom six survived to adulthood: Jahanara Begum, Shah Shuja, Roshanara Begum, Aurangzeb, Murad Bakhsh, and Gauhara Begum. As part of his formal education, Dara studied the Quran, history, Persian poetry and calligraphy. He was a liberal-minded unorthodox Muslim unlike his father and his younger brother Aurangzeb. In October 1627, Dara's grandfather Emperor Jahangir died, and his father ascended the throne in January 1628 taking the regnal name 'Shah Jahan'. In 1633, Dara was appointed as the Vali-ahad (heir-apparent) to his father. He, along with his older sister Jahanara, were Shah Jahan's favourite children. During the life time of his mother Mumtaz Mahal, Dara Shukoh was betrothed to his half-cousin, Princess Nadira Banu Begum, the daughter of his paternal uncle Sultan Parvez Mirza. He married her on 1 February 1633 at Agra; midst great celebrations, pomp and grandeur. By all accounts, Dara and Nadira were devoted to each other and Dara's love for Nadira was so profound that unlike the usual practice of polygyny prevalent at the time, he never contracted any other marriage. The imperial couple had seven children together, with two sons, Sulaiman Shikoh and Sipihr Shikoh and a daughter Jahanzeb Banu Begum, surviving to play important roles in future events. A great patron of the arts, Dara ordered for the compilation of some refined artwork into an album which is now famous by the name of 'Dara Shikhoh Album.' This album was presented by Dara to his 'dearest intimate friend' Nadira in 1641. Dara had at least two concubines, Gul Safeh (also known as Rana Dil) and Udaipuri Mahal (a Georgian or Armenian slave girl). Udaipuri later became a part of Aurangzeb's harem after her master's defeat. As was common for all Mughal sons, Dara Shukoh was appointed as a military commander at an early age, receiving an appointment as commander of 12,000-foot and 6,000 horse in October 1633[unreliable source?]. He received successive promotions, being promoted to commander of 12,000-foot and 7,000 horse on 20 March 1636, to 15,000-foot and 9,000 horse on 24 August 1637, to 10,000 horse on 19 March 1638, to 20,000-foot and 10,000 horse on 24 January 1639, and to 15,000 horse on 21 January 1642. 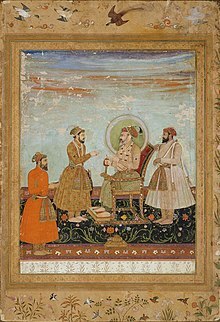 On 10 September 1642, Shah Jahan formally confirmed Dara Shukoh as his heir, granting him the title of Shahzada-e-Buland Iqbal ("Prince of High Fortune") and promoting him to command of 20,000-foot and 20,000 horse. In 1645, he was appointed as subahdar (governor) of Allahabad. He was promoted to a command of 30,000-foot and 20,000 horse on 18 April 1648, and was appointed Governor of the province of Gujarat on 3 July. As his father's health began to decline, Dara Shukoh received a series of increasingly prominent commands. He was appointed Governor of Multan and Kabul on 16 August 1652, and was raised to the title of Shah-e-Buland Iqbal ("King of High Fortune") on 15 February 1655. He was promoted to command of 40,000-foot and 20,000 horse on 21 January 1656, and to command of 50,000-foot and 40,000 horse on 16 September 1657. On 6 September 1657, the illness of emperor Shah Jahan triggered a desperate struggle for power among the four Mughal princes, though realistically only Dara Shukoh and Aurangzeb had a chance of emerging victorious. Shah Shuja was the first to make his move, declaring himself Mughal Emperor in Bengal and marched towards Agra from the east. Murad Baksh allied himself with Aurangzeb. Despite strong support from Shah Jahan, who had recovered enough from his illness to remain a strong factor in the struggle for supremacy, and the victory of his army led by his eldest son Sulaiman Shikoh over Shah Shuja in the battle of Bahadurpur on 14 February 1658, Dara Shukoh was defeated by Aurangzeb and Murad during the Battle of Samugarh, 13 km from Agra on 30 May 1658. Subsequently Aurangzeb took over Agra fort and deposed emperor Shah Jahan on 8 June 1658. 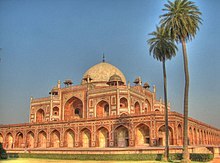 Humayun's Tomb, where the remains of Dara Shukoh were interred in an unidentified grave. After the defeat, Dara Shukoh retreated from Agra to Delhi and thence to Lahore. His next destination was Multan and then to Thatta (Sindh). From Sindh, he crossed the Rann of Kachchh and reached Kathiawar, where he met Shah Nawaz Khan, the governor of the province of Gujarat who opened the treasury to Dara Shukoh and helped him to recruit a new army. He occupied Surat and advanced towards Ajmer. Foiled in his hopes of persuading the fickle but powerful Rajput feudatory, Maharaja Jaswant Singh of Marwar, to support his cause, the luckless Dara Shukoh decided to make a stand and fight Aurangzeb's relentless pursuers but was once again comprehensively routed in the battle of Deorai (near Ajmer) on 11 March 1659. After this defeat he fled to Sindh and sought refuge under Malik Jiwan (Junaid Khan Barozai), an Afghan chieftain, whose life had on more than one occasion been saved by the Mughal prince from the wrath of Shah Jahan. However, the treacherous Junaid betrayed Dara Shukoh and turned him (and his second son Sipihr Shukoh) over to Aurangzeb's army on 10 June 1659. 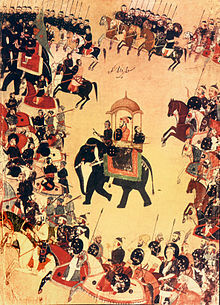 Dara Shukoh was brought to Delhi, placed on a filthy elephant and paraded through the streets of the capital in chains. Dara Shukoh's fate was decided by the political threat he posed as a prince popular with the common people – a convocation of nobles and clergy, called by Aurangzeb in response to the perceived danger of insurrection in Delhi, declared him a threat to the public peace and an apostate from Islam.He was assassinated by four of Aurangzeb's henchmen in front of his terrified son on the night of 30 August 1659 (9 September Gregorian). After death the remains of Dara Shukoh were buried in an unidentified grave in Humayan's tomb in Delhi. Niccolao Manucci, the Venetian traveler who worked in the Mughal court, has written down the details of Dara Shukoh's death. According to him, upon Dara's capture, Aurangzeb ordered his men to have his head brought up to him and he inspected it thoroughly to ensure that it was Dara indeed. He then further mutilated the head with his sword three times. After which, he ordered the head to be put in a box and presented to his ailing father, Shah Jahan, with clear instructions to be delivered only when the old King sat for his dinner in his prison. The guards were also instructed to inform Shah Jahan that, “King Aurangzeb, your son, sends this plate to let him (Shah Jahan) see that he does not forget him”. Shah Jahan instantly became happy (not knowing what was in store in the box) and uttered, “ Blessed be God that my son still remembers me”. Upon opening the box, Shah Jahan became horrified and fell unconscious. Shah Jahan was deeply anguished, to the point where he began to pull out his beard and blood started coming out profusely. A page from Majma-ul-Bahrain (a book on comparative religion by Muhammad Dara Shukoh) in the manuscripts collection at the Portrait Gallery of Victoria memorial, Calcutta. Dara Shukoh is widely renowned as an enlightened paragon of the harmonious coexistence of heterodox traditions on the Indian subcontinent. He was an erudite champion of mystical religious speculation and a poetic diviner of syncretic cultural interaction among people of all faiths. This made him a heretic in the eyes of his orthodox younger brother and a suspect eccentric in the view of many of the worldly power brokers swarming around the Mughal throne. Dara Shukoh was a follower of the Persian "perennialist" mystic Sarmad Kashani, as well as Lahore's famous Qadiri Sufi saint Mian Mir, whom he was introduced to by Mullah Shah Badakhshi (Mian Mir's spiritual disciple and successor). Mian Mir was so widely respected among all communities that he was invited to lay the foundation stone of the Golden Temple in Amritsar by the Sikhs. Dara Shukoh subsequently developed a friendship with the seventh Sikh Guru, Guru Har Rai. Dara Shukoh devoted much effort towards finding a common mystical language between Islam and Hinduism. Towards this goal he completed the translation of fifty Upanishads from their original Sanskrit into Persian in 1657 so that they could be studied by Muslim scholars. His translation is often called Sirr-e-Akbar ("The Greatest Mystery"), where he states boldly, in the introduction, his speculative hypothesis that the work referred to in the Qur'an as the "Kitab al-maknun" or the hidden book, is none other than the Upanishads. His most famous work, Majma-ul-Bahrain ("The Confluence of the Two Seas"), was also devoted to a revelation of the mystical and pluralistic affinities between Sufic and Vedantic speculation. The book was authored as a short treatise in Persian in 1654-55. The library established by Dara Shukoh still exists on the grounds of Guru Gobind Singh Indraprastha University, Kashmiri Gate, Delhi, and is now run as a museum by Archaeological Survey of India after being renovated. A Prince in Iranian Costume by Muhammad Khan. Dara Shikoh Album, Agra, 1633–34. He was also a patron of fine arts, music and dancing, a trait frowned upon by his younger sibling Muhiuddin, later the Emperor Aurangzeb. The 'Dara Shikoh' is a collection of paintings and calligraphy assembled from the 1630s until his death. It was presented to his wife Nadira Banu in 1641–42 and remained with her until her death after which the album was taken into the royal library and the inscriptions connecting it with Dara Shikoh were deliberately erased; however not everything was vandalised and many calligraphy scripts and paintings still bear his mark. Among the existing paintings from the Dara Shikoh Album, are two facing pages, compiled in the early 1630s just before his marriage, showing two ascetics in yogic postures, probably meant to be a pair of yogis, Vaishnava and Shaiva. these paintings are attributed to the artist Govardhan. The album also contains numerous pictures of Muslim ascetics and divines and the pictures obviously reflects Dara Shikoh's interest in religion and philosophy. Dara Shukoh is also credited with the commissioning of several exquisite, still extant, examples of Mughal architecture – among them the tomb of his wife Nadira Begum in Lahore, the Shrine of Mian Mir also in Lahore, the Dara Shikoh Library in Delhi, the Akhun Mullah Shah Mosque in Srinagar in Kashmir and the Pari Mahal garden palace (also in Srinagar in Kashmir). The issues surrounding Dara Shukoh's impeachment and execution are used to explore contradictory interpretations of Islam in a 2008 play, The Trial of Dara Shikoh, written by Akbar S. Ahmed. He is also the subject of a 2010 play called Dara Shikoh, written and directed by Shahid Nadeem of the Ajoka Theatre Group in Pakistan. Shukoh is the subject of the 2007 play Dara Shikoh, written by Danish Iqbal and staged by, among others, the director M S Sathyu in 2008. He is also a character played by Vaquar Sheikh in the 2005 Bollywood film Taj Mahal: An Eternal Love Story, directed by Akbar Khan. Dara Shukoh is the name of the protagonist of Mohsin Hamid's 2000 novel Moth Smoke, which reimagines the story of his trial unfolding in contemporary Pakistan. The television series Upanishad Ganga had two episodes titled "Veda - The Source of Dharma 1" and "Veda - The Source of Dharma 2", featuring Dara Shukoh played by actor Zakir Hussain. Gopalkrishna Gandhi wrote a play in verse titled Dara Shukoh on his life. Bengali Writer Shyamal Gangapadhyay wrote a novel on his life Shahjada Dara Shikoh which received Sahitya Academy Award in 1993. Assamese writer and politician, Omeo Kumar Das wrote a book called Dara Shikoh: Jeevan O Sadhana. Uzbek writer Hamid Ismailov wrote a novel called A Poet and Bin-Laden the second part of which devoted to the life of Dara Shikoh and Aurangzeb. An Assamese novel, Kalantarat Shahzada Dara Shikoh, was written by author Nagen Goswami. "Dara Shikoh" - a poem by poet Abhay K published in 2014 lamented the fact that there were no streets named after Dara. New Delhi Municipal Corporation (NDMC) changed Dalhousie Road's name to Dara Shikoh Road on February 6, 2017. In 2016 Bharatvarsh TV series, Rohit Purohit played the role of Dara Shukoh. In The 2017 novel 1636: Mission to the Mughals he is one of the central characters. Ranveer Singh has been cast as Dara Shukoh in the upcoming Karan Johar directorial Takht, stated for a 2020 release. Persian translations of the Yoga Vasishta and Bhagavad Gita. ^ a b c The Jahangirnama : memoirs of Jahangir, Emperor of India. Freer Gallery of Art, Arthur M. Sackler Gallery in association with Oxford University Press. p. 461. ISBN 9780195127188. ^ Sarkar, Sir Jadunath (1972). Sir Jadunath Sarkar birth centenary commemoration volume: English translation of Tarikh-i-dilkasha (Memoirs of Bhimsen relating to Aurangzib's Deccan campaigns). Dept. of Archives, Maharashtra. p. 28. ^ Awrangābādī, Shāhnavāz Khān; Shāhnavāz, ʻAbd al-Ḥayy ibn; Prashad, Baini (1952). The Maāthir-ul-umarā: being biographies of the Muhammādan and Hindu officers of the Timurid sovereigns of India from 1500 to about 1780 A.D. Asiatic Society. p. 684. ^ Thackeray, Frank W.; editors, John E. Findling, (2012). Events that formed the modern world : from the African Renaissance through the War on Terror. Santa Barbara, Calif.: ABC-CLIO. p. 240. ISBN 9781598849011. ^ Khan, 'Inayat; Begley, Wayne Edison (1990). The Shah Jahan nama of 'Inayat Khan: an abridged history of the Mughal Emperor Shah Jahan, compiled by his royal librarian : the nineteenth-century manuscript translation of A.R. Fuller (British Library, add. 30,777). Oxford University Press. p. 4. ^ "India was at a crossroads in the mid-seventeenth century; it had the potential of moving forward with Dara Shikoh, or of turning back to medievalism with Aurangzeb". Eraly, Abraham (2004). The Mughal Throne : The Saga of India's Great Emperors. London: Phoenix. p. 336. ISBN 0-7538-1758-6. ^ Dara Shikoh Medieval Islamic Civilization: An Encyclopedia, by Josef W. Meri, Jere L Bacharach. Routledge, 2005. ISBN 0-415-96690-6. Page 195-196. ^ Mehta, Jl (1986). Advanced Study in the History of Medieval India. Sterling Publishers Pvt. Ltd. p. 426. ISBN 9788120710153. ^ Nath, Renuka (1990). Notable Mughal and Hindu women in the 16th and 17th centuries A.D. Inter-India Publications. p. 113. ISBN 9788121002417. ^ Khan, 'Inayat; Begley, Wayne Edison (1990). The Shah Jahan nama of 'Inayat Khan: an abridged history of the Mughal Emperor Shah Jahan, compiled by his royal librarian : the nineteenth-century manuscript translation of A.R. Fuller (British Library, add. 30,777). Oxford University Press. p. 6. ^ a b c Koch, Ebba (1998). Dara-Shikoh shooting nilgais: hunt and landscape in Mughal painting. Freer Gallery of Art, Arthur M. Sackler Gallery, Smithsonian Institution. p. 43. ^ Sarker, Kobita (2007). Shah Jahan and his paradise on earth: the story of Shah Jahan's creations in Agra and Shahjahanabad in the golden days of the Mughals. K.P. Bagchi & Co. p. 187. ISBN 9788170743002. ^ a b Magill, Frank N. (2013). The 17th and 18th Centuries: Dictionary of World Biography. Routledge. p. 69. ISBN 9781135924140. ^ Schimmel, Annemarie; Schimmel, Former Professor Emerita Indo-Muslim Culture Department of Near Eastern Languages and Civilizations Annemarie (2004). The Empire of the Great Mughals: History, Art and Culture. Reaktion Books. p. 45. ISBN 9781861891853. ^ Edgar, Thorpe; Showick, Thorpe. The Pearson General Knowledge Manual 2018 (With Current Affairs & Previous Years' Questions Booklet). p. C.37. ISBN 9789352863525. ^ Sarkar, Sir Jadunath (1972). Sir Jadunath Sarkar birth centenary commemoration volume: English translation of Tarikh-i-dilkasha (Memoirs of Bhimsen relating to Aurangzib's Deccan campaigns). Dept. of Archives, Maharashtra. p. 12. ^ Koch, Ebba (1998). Dara-Shikoh shooting nilgais: hunt and landscape in Mughal painting. Freer Gallery of Art, Arthur M. Sackler Gallery, Smithsonian Institution. p. 7. ^ a b Sarker, Kobita (2007). Shah Jahan and his paradise on earth: the story of Shah Jahan's creations in Agra and Shahjahanabad in the golden days of the Mughals. K.P. Bagchi & Co. p. 80. ISBN 9788170743002. ^ a b c Hansen, Waldemar. The peacock throne : the drama of Mogul India. Motilal Banarsidass. p. 121. ISBN 9788120802254. ^ Koch, Ebba (1998). Dara-Shikoh shooting nilgais: hunt and landscape in Mughal painting. Freer Gallery of Art, Arthur M. Sackler Gallery, Smithsonian Institution. p. 29. ^ Mukhia, Harbans (2009). The Mughals of India. Wiley India Pvt. Limited. p. 124. ISBN 9788126518777. ^ Kishori Saran Lal. The Mughal harem. Aditya Prakashan. p. 30. ISBN 9788185179032. ^ a b c d e "delhi6". royalark.net. ^ Sarkar, Jadunath (1984). A History of Jaipur. New Delhi: Orient Longman. pp. 113–122. ISBN 81-250-0333-9. ^ Eraly, The Mighal Throne : The Saga of India's Great Emperors, cited above, page 364. ^ Francois Bernier Travels in the Mogul Empire, AD 1656–1668. ^ "Bad Muslim, good Muslim: Out with Aurangzeb, in with Dara Shikoh". ^ "The captive heir to the richest throne in the world, the favourite and pampered son of the most magnificent of the Great Mughals, was now clad in a travel-tainted dress of the coarsest cloth, with a dark dingy-coloured turban, such as only the poorest wear, on his head, and no necklace or jewel adorning his person." Sarkar, Jadunath (1962). A Short History of Aurangzib, 1618–1707. Calcutta: M. C. Sarkar and Sons. p. 78. ^ Hansen, Waldemar (1986). The Peacock Throne : The Drama of Mogul India. New Delhi: Orient Book Distributors. pp. 375–377. ISBN 978-81-208-0225-4. ^ Manucci, Niccolao (1989). Mogul India Or Storia Do Mogor 4 Vols. Set. Atlantic Publishers & Distributors (P) Limited. pp. 340–41. ISBN 817156058X. ^ The Hindu see for example this article in The Hindu. ^ Katz, N. (2000) 'The Identity of a Mystic: The Case of Sa'id Sarmad, a Jewish-Yogi-Sufi Courtier of the Mughals in: Numen 47: 142–160. ^ Dara Shikoh The empire of the great Mughals: history, art and culture, by Annemarie Schimmel, Corinne Attwood, Burzine K. Waghmar. Translated by Corinne Attwood. Published by Reaktion Books, 2004. ISBN 1-86189-185-7. Page 135. ^ Dr. Amartya Sen notes in his book The Argumentative Indian that it was Dara Shikoh's translation of the Upanishads that attracted William Jones, a Western scholar of Indian literature, to the Upanishads, having read them for the first time in a Persian translation by Dara Shikoh. Sen, Amartya. The Argumentative Indian. ^ Gyani Brahma Singh 'Brahma', Dara Shikoh – The Prince who turned Sufi in The Sikh Review[permanent dead link]"the reference in Al Qur’an to the hidden books – ummaukund-Kitab – was to the Upanishads, because they contain the essence of unity and they are the secrets which had to be kept hidden, the most ancient books." ^ Dara Shikoh's Library, Delhi Archived 11 April 2009 at the Wayback Machine Govt. of Delhi. ^ Dara Shikoh album British Library. ^ Losty, J P (July 2016). "Ascetics and Yogis in Indian Painting: The Mughal and Deccani Tradition": 14. ^ ‘The Trial of Dara Shikoh’ – A Play in Three Acts Text of the play with an Introduction by the author. ^ Published as Akbar Ahmed: Two Plays. London: Saqi Books, 2009. ISBN 978-0-86356-435-2, ‘The Trial of Dara Shikoh’ – A Thought-Provoking Play Archived 15 August 2009 at the Wayback Machine A review of the play. ^ "For king and country". The Hindu. ^ Hamid, Mohsin. (2000). Moth Smoke. p. 247. ^ "Episode-guide". upanishadganga.com. Retrieved 27 August 2016. ^ "Dara Shukoh". Goodreads. Retrieved 12 September 2016. ^ "Movie Mogul, Maybe". outlookindia.com. Retrieved 25 March 2018. ^ MAJMA' UL BAHARAIN or The Mingling Of Two Oceans, by Prince Muhammad Dara Shikoh, Edited in the Original Persian with English Translation, notes & variants by M.Mahfuz-ul-Haq, published by The Asiatic Society, Kolkata, Bibliotheca Indica Series no. 246, 1st. published 1929. See also this Archived 9 September 2009 at the Wayback Machine book review by Yoginder Sikand, indianmuslims.in. ^ See the section on his Intellectual Pursuits. Eraly, Abraham (2004). The Mughal Throne: The Saga of India's Great Emperors. Phoenix, London. ISBN 0753817586. Hansen, Waldemar . The Peacock Throne: The Drama of Mogul India. Orient Book Distributors, New Delhi. Mahajan, V.D. (1978). History of Medieval India. S. Chand. Sarkar, Jadunath (1984). A History of Jaipur. Orient Longman, New Delhi. Sarkar, Jadunath (1962). A Short History of Aurangzib, 1618–1707. M. C. Sarkar and Sons, Calcutta. Wikimedia Commons has media related to Dara Shikoh.